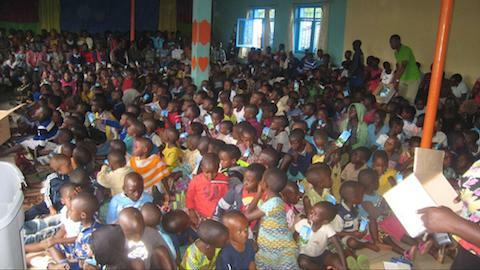 Christmas for community children was a bit overwhelming. We knew it would be more than last year, but the over 600 who attended was more than we expected. Kids arrived early, waiting for doors to open at 1:30 p.m.
Hope House is full and runneth over. Overflow. On outside retaining wall and steps. All children were served inside and outside. We decided that we could not use chairs this year. Mats were placed on the floor in Hope House. Benches were along the far wall for teens. Chairs on platform were for mamas with babies. Ok now we are ready. We think. Boxed milk, meat sumbosa and juice for those who cannot tolerate milk were the treats for the day. Entertaining so many children, it was necessary to have not only a system to serve refreshments but also to give gifts and have an exit setup so that there was crowd control. Interesting!! Plan A. Give refreshments, collect trash. Girls line up for Door No. 1. Boys line up for Door No. 2. Receive gift, exit building. It worked. Executive secretary Eric and Johnny. 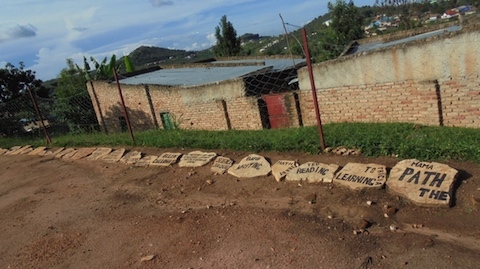 Claude, Luki, Aline, David, Soso and John helped serve the kids and did the outside cleanup after the finish. They did a great job. Thanks, guys. If hearts sing and love abounds in February, mine is right in tune. Urukundo is so blessed. We have big news to share! We have a new name for our Dental Initiative. University of Rwanda College of Medicine and Health Sciences, School of Dentistry and Urukundo Dental. Document signing, sealed with a handshake. A delegation of 7 came to Urukundo Village from the University School of Dentistry to take part in the signing ceremony making Urukundo Dental Initiative part of the School of Dentistry. 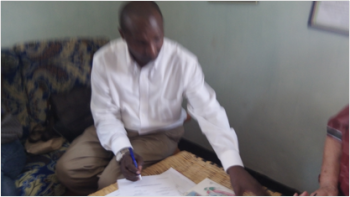 Muhumuza Ibra - Dean, School of Dentistry - University of Rwanda College of Medicine and Health Sciences. Karl Self - University of Minnesota School of Dentistry and Donna. Sawsan Salih - Associate to the Dean of the School of Dentistry, Harvard School of Dental Medicine. Valli Meeks - University of Maryland School of Dentistry. Valli is from Philadelphia, PA. She is definitely a HOME GIRL for me - same accent! 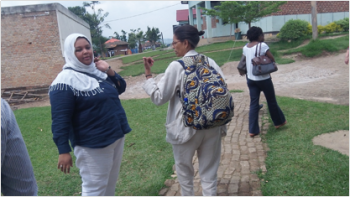 Valli, Sawsan and Karl are part of the United States faculty working with the Rwanda Human Resources for Health Project. Ethel and Julienne are instructors at the University School of Dentistry. This is a brief summary of how it will operate. The school will pay for food and housing only for their students and instructor. 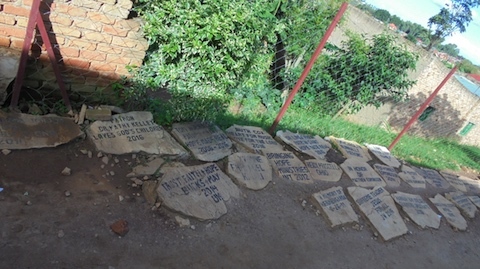 There is no large financial gain for Urukundo from the school but there will be recognition and the connection with the University giving us creditability. We are a fully equipped Dental Clinic in operation. 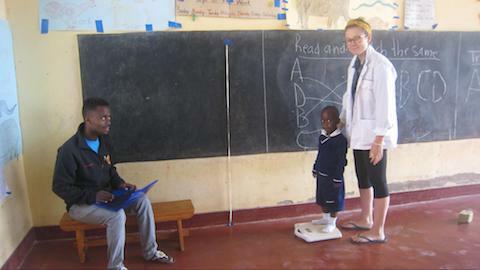 We purchase our own supplies and have our volunteer clinic staff. The University will supply the guidelines to ensure we conform with government regulations. They will also respond to any urgent needs. We can do our own charging for services. For difficult cases, we can send the client to the Dental Hospital at the University and the cost will not change for our patients. This will give them access to dental services they could otherwise not afford. Also our dental service can now advertise and be open Monday through Saturday noon. This will give us many more clients. Our clients pay a minimum charge for consultation and depending on the service needed the cost will be determined by what the client can afford. Some will be free and others will pay a reasonable cost. We hope in that way to give good service and to pay for needed supplies. We are operating under the University license. This is an important contribution from the School of Dentistry. There will be 6 to 10 students coming for clinical training each month on a two-week rotation program and an instructor coming with them. This is a very important step for Urukundo. It also helps our standing in the district. It should be very interesting. I am sure there will be changes as we move forward. We are a pilot program for the University. If our relationship is successful the University will expand the program to other areas of Rwanda using Urukundo as the model. There are 20 kids in the Saturday morning Karate class. 9 are our kids, 11 are from the community and the group comprises both boys & girls. It is awesome to watch these kids and the master at work. It is work with dedication. Our 5 first and 4 second graders love karate! When the team is ready they will compete with other teams of their age. Our master teaches as a volunteer. We could not afford ready-made uniforms from stores in Kigali town so our Sewing Center took a pattern, bought material and made uniforms. They are great. Good work, sewing students! These uniforms are also available to the neighborhood parents. They can buy them for their kids at an affordable price. I think the kids look great - comments from our readers are appreciated! One of the neighborhood kids has a yellow belt. I'm not sure what that means in terms of advancement for children even though my son Ted is a black belt! Volunteer Master & kids: Pete in a brown belt. He is very good with the kids. Our first official sewing class started May 20,2014. Five students enrolled. These young women have completed Primary School and have no way to go further in education because of the high cost of tuition. Without a skill there is no job available. Urukundo Sewing Center founded and funded by generous supporters in the US and Canada, offers machines to teach sewing and has opened a door that was closed for them. 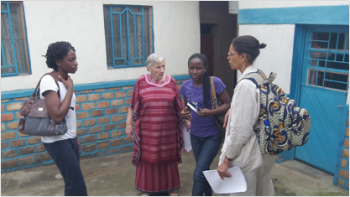 Therese Mukabanany, our teacher for basic sewing, machine maintainance and theory. 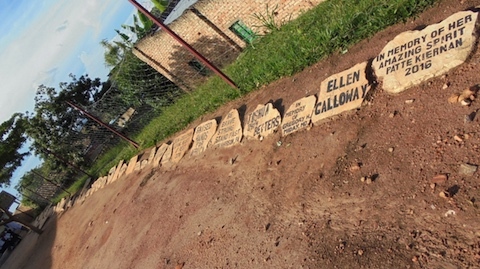 Therese had 7 children, but she lost 4 during the genocide and now has 3 in her home. It is important to her that she can educate her remaining children. She was a housewife before starting to sew. 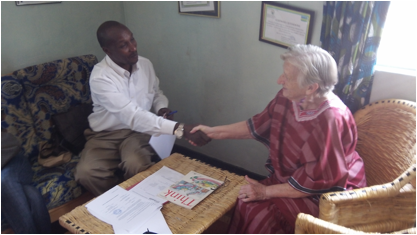 With this job she is able to pay school fees for her children and support her family. Her diploma is from ECOLE TECHNIQUE SCHOOL FOR SEWING. 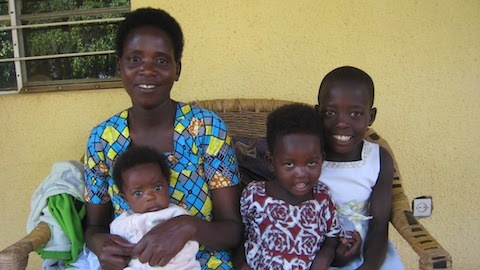 “I can pay school fees for my all my children and take care of family." An opportunity for you to help women and girls to have training in a trade where they can earn an income and provide a better future for themselves and to help their families move out of poverty. 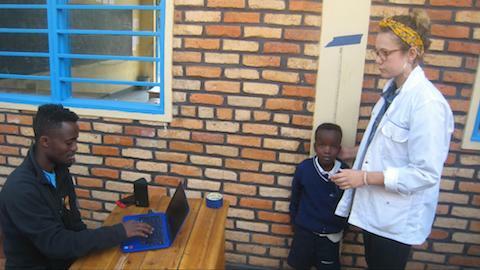 $192 USD will provide tuition for a full year of training. $192 to give a woman or girl a new lease on life. These are persons who are hard workers and want a better future for themselves and others. Florida is single and has 7 younger brothers and sisters. Before now her life has been cleaning in other peoples homes when she could find the work. Florida said "Learning to sew will give a job so I can have a better future. I also want to be able to take care of my brothers and & sisters." Florida hopes to become a teacher. 20 years old, Divine is an orphan with 1 sibling. She stays with a person who wishes her well. She says: "I will be able tp get a job and support myself. I will stop burdening people with my needs." Jacqueline Irahuzais, 15 years old, finished primary school at age 12. For 3 years she has prayed for a way to help her family and herself. Her parents are poor and so secondary school was not affordable for her. There is no work available for this young girl. She is so grateful for this opportunity to learn a trade. With 8 siblings, Phiobe is 16 and has finished primary school with no secondary education in sight due to family poverty. She is unhappy to be at home without anything to do. Her goal is to become a seamstress in time, to own her own machine and have a small business. "I will be able to get a job to support my parents and siblings." 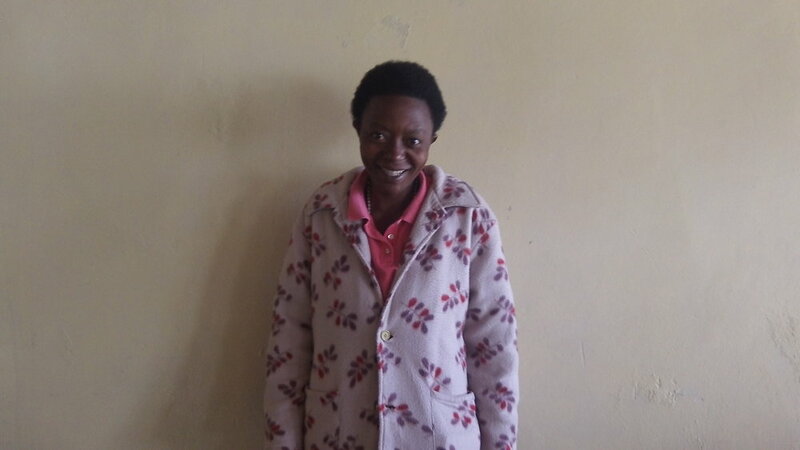 Jacqueline Irahuza - she has 3 siblings and her father is a carpenter. Jacqueline is 15 years old and finished primary school at age 12. For 3 years she has prayed for a way to help her family and herself. Her parents are poor and so secondary school was not affordable for her. There is no work available for this young girl. "Earning some income is important to me.I am so grateful for this opportunity to learn a trade. I never thought this could happen." Melanie has 4 siblings, her father is one of guards at Urukundo. Her thought is: "This is an opportunity for me to be self reliant." 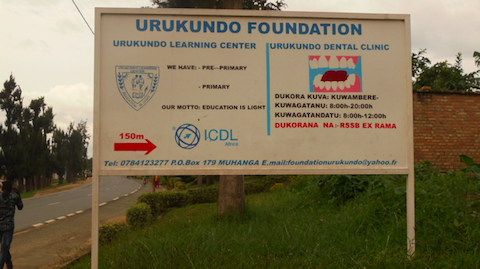 We are so grateful to all the dentists out there who contributed to make this much needed service available at Urukundo Village. Our first day we scanned 85 children from Urukundo Primary School. 55 needed dental attention and 29 of the 55 needed urgent care. Notices were sent home to the parents of all children seen. Follow up calls were made. Saturday March 1st 29 were seen with their parents. Saturday March 15th 33 were seen with parents. Parents and children sitting on benches on the porch of the Girls' House waiting their turn. Little benches outside the Tiki Hut, our dental workstation. How do you like the grass roof? We really need to get a new roof, but I think this one adds character. What do you all think? Dentist, Mom and another patient. Most times the parents are more anxious than the kids. After covering the Home and school we are opening care and treatment to the children and adults in the community. Our continuing need is funding for Novocain, Amoxicillin to fight infection after extractions, Ibuprofen for pain and sterile gloves. These can be purchased in Kigali Town as needed. On Feb 28 our Dentist spent an afternoon explaining and demonstrating dental hygiene to the Primary classes. Our Dental Initiative is an all-inclusive program. 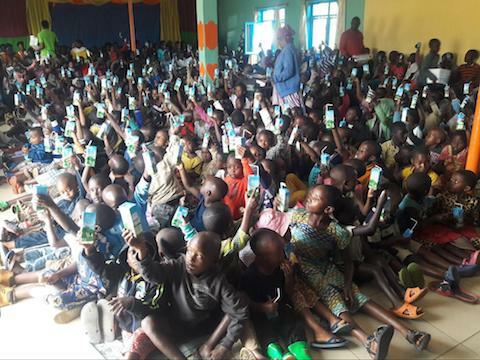 Toothbrushes, toothpaste and smiling kids!